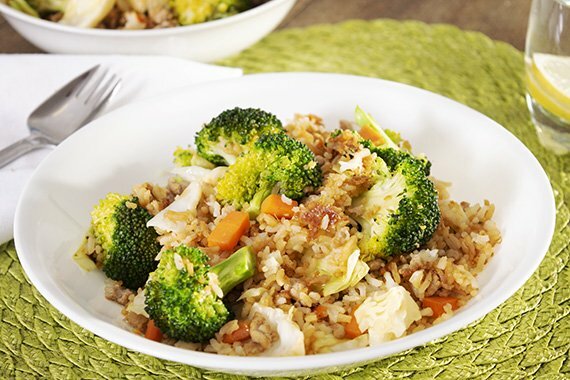 This quick and simple fried rice is sure to please the whole family. Healthy and delicious it combines a soy vinegar dressing with the fresh flavours of cabbage and broccoli. If you happen to have leftovers, it’s great for lunch the next day! (Tip: if you want to cook your rice the day before, go ahead, just heat it through a bit longer in step 5). Share your moment on Instagram #youplateit. In a medium pot, bring 1&frac13; cup water to a boil. Stir in the rice; cover and reduce the heat to low. Simmer for 15 minutes until all of the water is absorbed. Taste the rice; if it is still too firm, add a few more tablespoons of water. Cover the pot and let the rice absorb the water off of the heat. Fluff the finished rice with a fork. Wash the fresh produce. Peel and mince garlic and ginger. Peel carrot and cut into 1cm dice. Cut broccoli into florets and roughly chop cabbage into 1.5 - 2 cm dice. To a large pan over medium high heat, add enough oil to coat the pan. Add mince and stir fry, breaking up with a spoon, about 4 minutes - until browned and cooked through. Set mince aside in a bowl to keep warm. Using the same pan, add a little more oil (to coat the pan). Over medium high heat, add ginger, garlic, carrot and broccoli and stir fry for 2 - 3 minutes until vegetables are tender. Stir in cabbage and cook for a further minute. Add pork, rice and soy/vinegar mix and stir until well coated. Season to taste with salt and pepper. Divide fried rice between bowls and serve. Enjoy!